In this tutorial I’ll show the workflow I use to create a four hands piano score, and optionally, how to export a midi/audio reference. 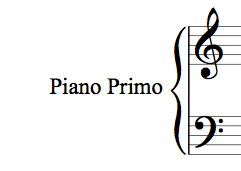 Piano music for four hands has in general the lower part (Secondo) notated on the left hand pages, and the higher part (Primo) notated on the right hand pages. This way, the two players can easily read their own parts while following the other player’s part. In this example I will create a basic template with 4 pages having 5 systems each, in which every system has 4 bars, what would be 20 bars on a page and a total of 80 bars on 4 pages. 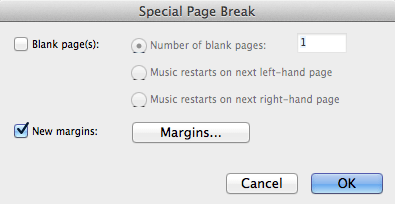 Later when you to enter the music, you can always add or delete bars on a page. Start by creating a normal piano solo score. 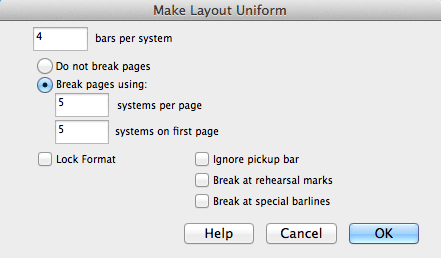 Create a system break after every 4 bars. 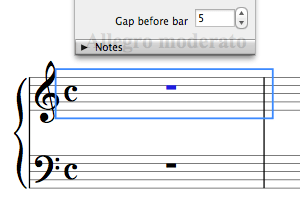 To show the part name at the start of the score for the Secondo part, go to the House Styles menu/Engraving Rules/Instruments, and in the Instrument Names tab, choose Full to be displayed At start. 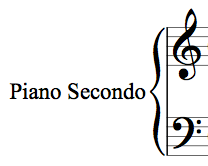 Right now, both parts are named Piano Secondo, however the second part must be named Piano Primo. Renaming the text will not help; both part names will stay the same because it’s the same Instrument. 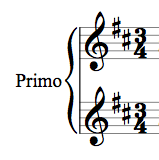 The solution here is to create an instrument change in the first bar of the Piano Primo part. While engraving the music in the score, avoid that the template layout changes and accidentally deletes the special page breaks. 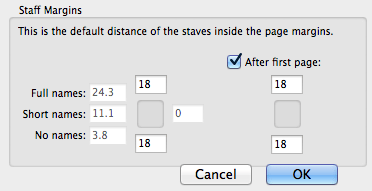 Instead, add and delete bars somewhere in the middle of the pages and leave the 1st and last bar on every page as they are. To delete bars, hold down the CMD key, select a bar, add the SHIFT key, click the last bar. Hit delete. To align text and other kind of objects on the left- and right pages, select these object and use the Align in a Row command from the Layout menu. Exporting this score as midi or audio is a problem because the parts are not notated above each other but on two separate pages, making the two piano parts being played after each other instead of at the same time. The workaround for this is to create a second score for midi/audio export only where the two piano parts are notated on the same page, and copy/paste the music from the notation layout into this second score. After that it’s easy to export the midi/audio files. Copy and paste the music from the Notation version into this template. Be careful not to forget special bar-lines, key- and time signatures.